While the Bing Ads platform may not be the paid search market leader, its updates are indicative of how the wider digital landscape is evolving outside of Google’s dominant ecosystem. The adoption of automated bidding strategies until now has been relatively tentative in some circles. But now Bing is getting onboard with conversion-led automated bidding strategies, it’s time everyone did. Last week, Bing announced the release of two new bidding strategies; ‘Target CPA’ and ‘Maximize Conversions’. The former is the most requested feature on Bing’s UserVoice platform of 2018 so far, and they’ve been in testing with selected advertisers for over a year. Finally, they’re available for all accounts with campaigns targeting Australia, Canada, France, Germany, the US, and the UK. But what do they actually do? Target CPA: This strategy aims to drive conversions at your target CPA. It does this at a campaign level, meaning you may have keywords more efficient, and others less efficient, but it will even out when looking at the campaign as a whole. Maximize Conversions: This strategy aims to deliver as many conversions as possible, within a campaign’s budget. To use these new bidding strategies your account has to have Universal Event Tracking in place and the campaign needs a minimum of 15 conversions in the last 30 days. For advertisers where this threshold is too high, we suggest using a conversion indicator like an ‘add to basket’ event or newsletter sign-up. Using these micro-conversions as indicators of performance will allow you use the new bidding strategies but remember to adjust your target CPA accordingly. Not sure which bidding strategy to use? 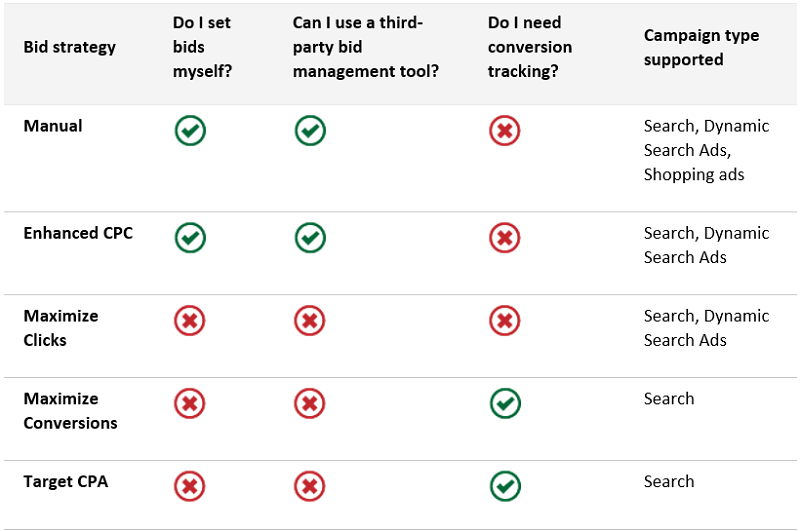 Bing have put together a handy comparison table to help explain the different bidding strategies on offer. These new bidding strategies are part of Bing’s focus on technology to help automate, empower and simplify common workloads. It reflects an overall industry shift towards AI-driven automation, something that was a central part of Google’s recent conference, Google Marketing Live. Here at SearchStar, we’re excited to start testing these new bidding strategies for our clients on Bing, and fully embracing the next stage of automation in advertising. If you want any advice using Bing’s new bidding strategies, or the wider world of automation, get in touch with the team.